Siegfried�s family name was originally Abramcyk. He was a Christian with Jewish ancestors, who was nevertheless a brilliant quartermaster with the Wehrmacht during WWII, and later became Finance-Minister, first in Flensburg, then in Niedersachsen. He and Eva spent much time in Hanerau right after the war, playing often in the 50 Hausmusikabenden of the Hausmusikvereins Hanerau-Hademarschen between Sept. 8, 1946 and May 27, 1949. He played violin, viola, and sang 20 times, she 38 times. Eva was the daughter of the Headmaster of the school in Pl�n where Charlotte's brother, Mannfred, and sister, Hedi, had attended. Her family disowned her because she married a Jew! She (they) adopted the Hanerauer as a substitute family. Eva's sister, Leo Wienbeck (who married a Nazi judge! ), was a study-mate of Jan's at the L�beck Conservatory, while Eva herself was a class-mate of Charlotte's brother Mannfred. After the war, when the families were waiting for soldiers to return home to Hanerau, the first one to arrive was Siegfried--he had sent Eva on ahead there to wait for him, since she couldn't go to her own home in Pl�n. Partita on "How Brightly Shines the Morning Star"
printed (by Constabel, Hademarschen), 1987.
manuscript says: "f�r unseren lieben, verehrten Herrn Pastor Karl Emil Schade zum 60. Geburtstag am 5. 7. 1987." This piece was sung by the choirs for the composer�s funeral service at St. Severinkirche in Hademarschen on January 4, 1995, conducted by Norbert Klose. Vor- und Nachspiel for fl, ob, clar(in A), fag. manuscript dated May 31, 1988. The Master Organ Works of Jan Bender, vol. 3, ed. David Fienen. Concordia 2005. 97-7100.
a manuscript copy says "f�r unsere liebe Organistin, Frau Thea Kruse." Bender�s own handwritten Werkverzeichnis says: "Constanze Pfeiffer gewidmet.� Composed June 16, 1988. Score delivered [to Birgit] on December 16, 1988 in Mannhardtstra�e 69. First performance: March 5, 1989 in Peter-Pauls-Kirche, Hohenwestedt. 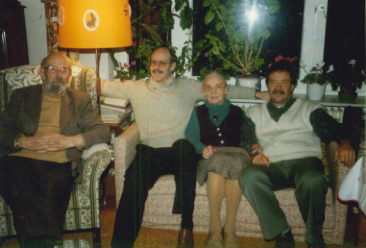 Anita and Harald K�nnecke, trpts, Wilfrid Myles, organ. Published by the Nordelbischen Kirchenchorverband in 1989 on the occasion of the 80th birthday of the composer.